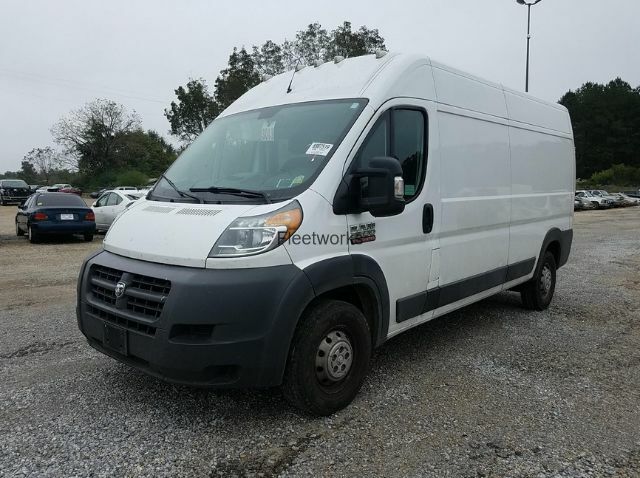 Fleetworks offers used RAM ProMaster vans for sale in our Houston, Texas location at 4815 Katy Freeway. We carry several RAM ProMasters with low miles, clean CARFAX, full maintenance record, accident-free, inspected in 100+ points and tested to provide you with the world-class buying experience. For more information about used RAM ProMasters in our inventory call (713) 909-7261. Si habla Espanol. The first generation of ProMaster van hits the streets in 2014. This was an entirely new commercial vehicle for the US drivers, but back in Europe, it was in use for many years, although under a different name – FIAT Ducato. 2.4 million units are sold in Europe. ProMaster has the same chassis, design, and interior like Ducato, but engine and transmission are tailor-maid to US roads and drivers. Until today it remained pretty much the same, except few cosmetical changes and minor facelifts on the front grille of 2018 Ram Promaster. Vehicle comes in four configurations; cargo van, windows van, chassis cab, and cutaway cab. Window van doesn’t have seats, but many companies install seats and that way transform ProMaster to a proper people carrier which can accommodate 12 passengers. 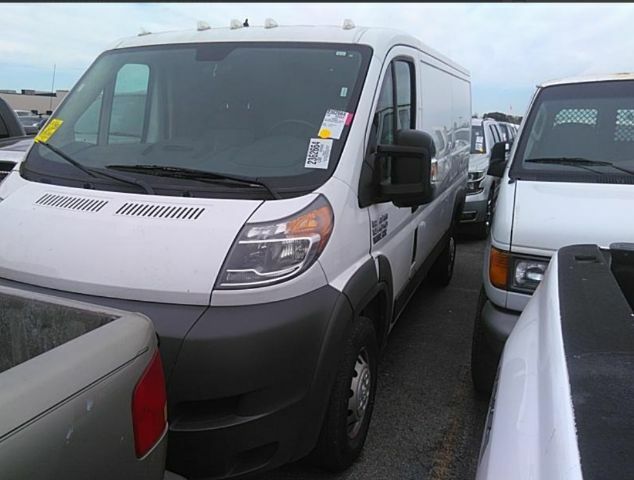 - ProMaster 3500 – 4,680 pounds. Depending on van wheelbase and roof height there are 10 variations of ProMaster cargo van you can choose. It is a real champ when it comes to functionality. RAM praise itself with best in class width between wheel wells of 56 inches. Large distance between wells along with lowest floor height guarantees easy loading and access to rear space. We already mentioned that main difference between its European sibling lies in engine and transmissions. The US roads require more powerful engines than those in Ducato. Chrysler engineers decided to offer two engines, one diesel and the second petrol. Both engines have 6-speed transmission, but diesel has an option for manual gear change. This is an automated manual transmission. Gas units use an automatic transmission. The petrol engine is well known 3.6L V6 Pentastar used in many Chrysler vehicles. When it’s under the bonnet of ProMaster, it delivers 280 HP and 260 lb.-ft of torque at 4,175 rpm. ProMaster 1500 with this powerplant reaches 60 mph in 8.1 seconds and has a top speed of 100 mph. This is quite enough for plumbers, electricians, and handyman who mostly buy this van instead of a truck. When properly equipped it can tow 5,100 pounds. Average fuel economy for van equipped with a gas engine is 13 mpg in the city and 18 mpg on the highway. Diesel 3.0L, 4-cylinder engine has a turbocharger and delivers 174 HP. Despite the small displacement, it has fantastic torque (like all vehicles with a diesel engine) of 295 lb.-ft of torque. Best of all, torque is available at incredibly low 1,400 rpm. If you need work van capable for massive towing diesel engine should be your priority. 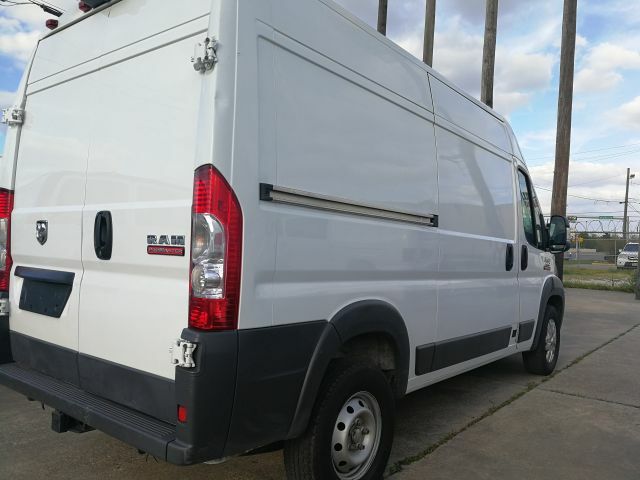 The downside of diesel units is the price, but you can always search for used RAM ProMaster for sale and save much money. 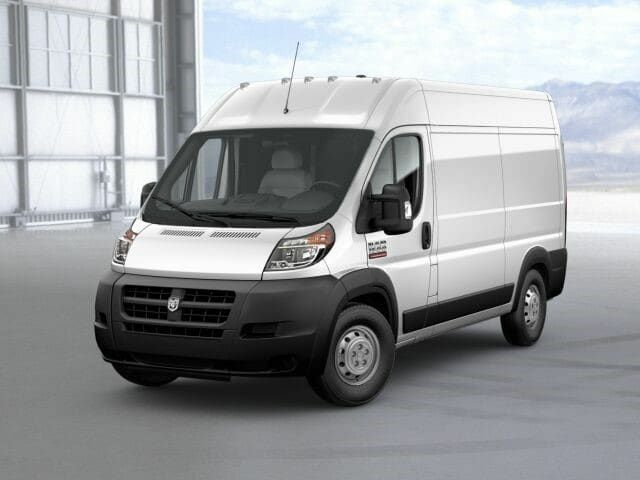 Ram ProMaster Diesel estimated fuel economy is 18 mpg and that makes it one of the most fuel efficient cargo van in our market. This is why we are surprised to see that 2019 ProMaster is not offered with a diesel engine. Most noticeable difference to other vans is front-wheel drive. Front-wheel drive means tight turning circle which is very convenient in the city and easy handling in showy and slippery conditions. Rear-wheel vans can struggle in muddy roads, but ProMaster has no troubles, especially if it’s equipped with all-terrain tires. Inside RAM ProMaster there is nothing to be excited with, but this is a commercial vehicle, right. It’s more about usability and versatility than beauty. Seats are comfortable for long rides and have 180 degrees swivel option for easy access to backspace. The steering wheel has multifunctional commands. AC climate control, keyless entry, power windows, USB port, airbags, and FM radio come as standard. Below gear lever, there are three cup holders. 2018 Ram ProMaster includes a rear camera as standard. Cool thing about the camera is it turns on every time you open the rear doors. Additional goodies include leather steering wheel, Uconnect features, 5-inch touchscreen with Bluetooth connection to sync your phone, voice command, navigation, satellite radio, heated seats, 4G WIFI hotspot, cruise control, and locking glove compartment. Walls are almost at 90 degrees, it’s very boxy inside the cargo area, and this is the feature many delivery drivers will appreciate. It’s easy to maneuver inside, move packages and pallets. There are many ample wall and roof studs. They are pre-drilled, and you’ll find them very useful if you want to install van shelving. The floor has many tie-down points too, and there is one 12-volt outlet near the back doors. Job-related customization is a piece of cake with ProMaster. Nice thing is you can activate rear camera any time you need to and check trailer or everything that’s going on behind the van. ProMaster has two side sliding doors, both 4 feet wide. These are the widest opening doors in full-size cargo van segment. Front wheel-drive allows very low step-in height; this means you don’t need to crawl in cargo space. There is plenty of headroom. Big rear doors can open by 270 degrees. Like in Transit, they have bumpers to protect the exterior of the van when you need to open them at full angle. All trim levels have fog lights. Front bumper is made out of three pieces (modular system), so if you smash it, you can easily replace just one piece of the bumper. There is a full-size hitch; nominal towing capacity is 5100 pounds. Units with side windows have metal mesh inside the van to protect the glass from heavy and bulky loads. Van has several standard safety features for modern commercial vehicles. There are six airbags, electronic stability controls, antilock brake system, trailer sway control, hill start assist, and all-speed traction control. These come as standard, but rear parking sensors are optional. 2018 RAM ProMaster has not been tested on crash-tests by independent nor federal agencies. Unlike main rivals, Ford Transit and Mercedes Sprinter, RAM doesn’t offer lane departure warnings, collision alerts or other advanced safety technologies. Van is very comfortable, but the driving position is rather high, and this can be annoying to tall drivers. Driver seat is possible to adjust. When it comes to the steering wheel, it is telescopic, and it will go in and out but not tilt up and down. So, you can’t adjust the steering wheel angle. Power delivery, acceleration, and top speed are quite good for a commercial vehicle. Handling is very smooth, no matter if you ride on the highway or tight city streets. The ride is quiet, comfortable and sleek. This is surprising for a vehicle with such poor dynamic. Turning range is incredible. You can make donuts with 1500 unit in 36.3 feet. The short front end and wide front windshield increase driver visibility.